£10 if bought before 1 May/£12 if bought in advance/£15 on the door. 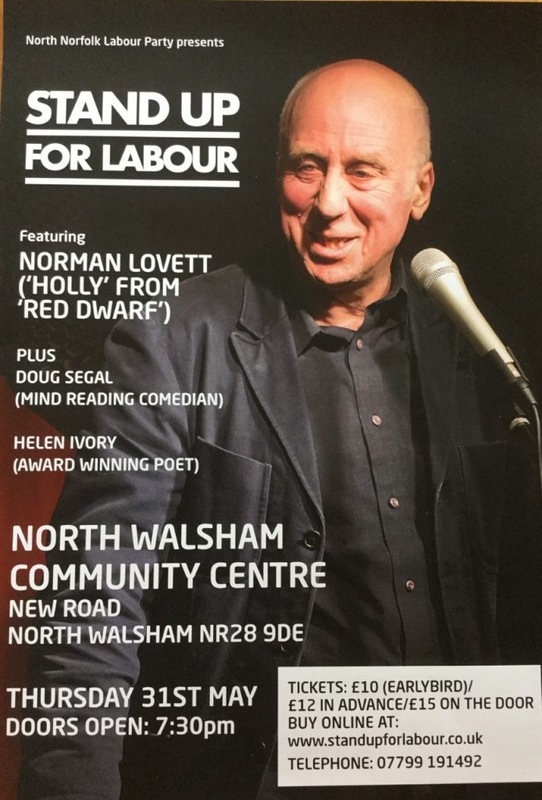 Stand up for Labour puts on a fundraiser for North Norfolk CLP at North Walsham Community Centre (New Road, North Walsham NR28 9DE). Doug Segal has been described by Time Out magazine as ‘the UK’s best kept entertainment secret’. His mind-reading act has seen him sell out two UK tours and make numerous TV appearances. Helen Ivory has won a Gregory Award and her fourth Bloodaxe Books collection, the semi-autobiographical, Waiting for Bluebeard, was short-listed for the East Anglian Book Awards. Norman Lovett is one of the most influential comedians in the country, who has developed his own style of comedy since the 1970s. He once warmed up for Punk band ‘The Clash’ and is well known for appearing as ‘Holly’ in cult TV sitcom ‘Red Dwarf’. The night is hosted by Crispin Flintoff, who set up Stand up for Labour in 2012 as he believed that political events were not inspiring or entertaining enough. He has now organised over 200 shows in England, Scotland and Wales and, in doing so, has inspired more people to get involved in politics and has raised money for the Labour Party as well. Tickets cost £10 if bought before 1 May/£12 if bought in advance/£15 on the door.